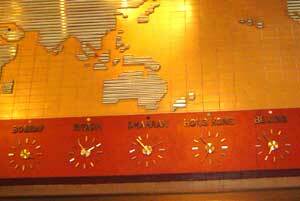 Aramcons and ex-Aramcons departing from Thailand through Bangkok’s Don Muang airport may still get a nostalgic uplift if they glance at the row of world time clocks above the passport control desks in Terminal 1 (Thai International’s terminal). Dhahran still figures there prominently, sandwiched between Bombay, Riyadh, Hong Kong and Beijing, a reflection of its one-time prominence in the world airport league. Possibly the only airport in the world where Dhahran is still honored in this way! You will have to hurry to see this, however, since Don Muang airport is due to close to passenger traffic in a year or so, when Bangkok’s new airport opens. Brian and Carolyn Walling, first started traveling from Dhahran to Bangkok in 1978 and have continued traveling there regularly, even after leaving Dhahran in 1996. They expect, in fact, to relocate to South East Asia in the near future.